Lead /ˈliːd/ and pitch are closely related concepts. They can be confused because they are the same for most screws. Lead is the distance along the screw's axis that is covered by one complete rotation of the screw (360°). Pitch is the distance from the crest of one thread to the next. Because the vast majority of screw threadforms are single-start threadforms, their lead and pitch are the same. Single-start means that there is only one "ridge" wrapped around the cylinder of the screw's body. Each time that the screw's body rotates one turn (360°), it has advanced axially by the width of one ridge. "Double-start" means that there are two "ridges" wrapped around the cylinder of the screw's body. Each time that the screw's body rotates one turn (360°), it has advanced axially by the width of two ridges. Another way to express this is that lead and pitch are parametrically related, and the parameter that relates them, the number of starts, very often has a value of 1, in which case their relationship becomes equality. In general, lead is equal to pitch times the number of starts. Whereas metric threads are usually defined by their pitch, that is, how much distance per thread, inch-based standards usually use the reverse logic, that is, how many threads occur per a given distance. Thus inch-based threads are defined in terms of threads per inch (TPI). Pitch and TPI describe the same underlying physical property—merely in different terms. When the inch is used as the unit of measurement for pitch, TPI is the reciprocal of pitch and vice versa. For example, a 1⁄4-20 thread has 20 TPI, which means that its pitch is 1⁄20 inch (0.050 in or 1.27 mm). As the distance from the crest of one thread to the next, pitch can be compared to the wavelength of a wave. Another wave analogy is that pitch and TPI are inverses of each other in a similar way that period and frequency are inverses of each other. Coarse threads are those with larger pitch (fewer threads per axial distance), and fine threads are those with smaller pitch (more threads per axial distance). Coarse threads have a larger threadform relative to screw diameter, where fine threads have a smaller threadform relative to screw diameter. This distinction is analogous to that between coarse teeth and fine teeth on a saw or file, or between coarse grit and fine grit on sandpaper. The common V-thread standards (ISO 261 and Unified Thread Standard) include a coarse pitch and a fine pitch for each major diameter. For example, 1⁄2-13 belongs to the UNC series (Unified National Coarse) and 1⁄2-20 belongs to the UNF series (Unified National Fine). Similarly, ISO261 M10 (10mm (398 thou) nominal outer diameter) has a coarse thread version at 1.25mm pitch (49 thou) and a fine thread version at 1 mm (39 thou) pitch. The term coarse implies here does not mean lower quality, nor does the term fine imply higher quality. The terms when used in reference to screw thread pitch have nothing to do with the tolerances used (degree of precision) or the amount of craftsmanship, quality, or cost. They simply refer to the size of the threads relative to the screw diameter. Coarse threads are more resistant to stripping and cross threading because they have greater flank engagement. Coarse threads install much faster as they require fewer turns per unit length. Finer threads are stronger as they have a larger stress area for the same diameter thread. Fine threads are less likely to vibrate loose as they have a smaller helix angle and allow finer adjustment. 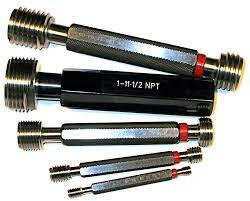 Finer threads develop greater preload with less tightening torque. There are three characteristic diameters of threads: major diameter, minor diameter, and pitch diameter: Industry standards specify minimum (min) and maximum (max) limits for each of these, for all recognized thread sizes. The minimum limits for external (or bolt, in ISO terminology), and the maximum limits for internal (nut), thread sizes are there to ensure that threads do not strip at the tensile strength limits for the parent material. The minimum limits for internal, and maximum limits for external, threads are there to ensure that the threads fit together. The major diameter of threads is the larger of two extreme diameters delimiting the height of the thread profile, as a cross-sectional view is taken in a plane containing the axis of the threads. For a screw, this is its outside diameter (OD). The major diameter of a nut may not be directly measured, but it may be tested with go/no-go gauges. The major diameter of external threads is normally smaller than the major diameter of the internal threads, if the threads are designed to fit together. But this requirement alone does not guarantee that a bolt and a nut of the same pitch would fit together: the same requirement must separately be made for the minor and pitch diameters of the threads. Besides providing for a clearance between the crest of the bolt threads and the root of the nut threads, one must also ensure that the clearances are not so excessive as to cause the fasteners to fail. The basic profile of all UTS threads is the same as that of all ISO metric screw threads. Only the commonly used values for Dmaj and P differ between the two standards. The minor diameter is the lower extreme diameter of the thread. Major diameter minus minor diameter, divided by two, equals the height of the thread. The minor diameter of a nut is its inside diameter. The minor diameter of a bolt can be measured with go/no-go gauges or, directly, with an optical comparator. As shown in the figure at right, threads of equal pitch and angle that have matching minor diameters, with differing major and pitch diameters, may appear to fit snugly, but only do so radially; threads that have only major diameters matching (not shown) could also be visualized as not allowing radial movement. The reduced material condition, due to the unused spaces between the threads, must be minimized so as not to overly weaken the fasteners. Variants of snug fit. Only threads with matched PDs are truly snug, axially as well as radially. The pitch diameter (PD, or D2) of a particular thread, internal or external, is the diameter of a cylindrical surface, axially concentric to the thread, which intersects the thread flanks at equidistant points, when viewed in a cross-sectional plane containing the axis of the thread, the distance between these points being exactly one half the pitch distance. Equivalently, a line running parallel to the axis and a distance D2 away from it, the "PD line," slices the sharp-V form of the thread, having flanks coincident with the flanks of the thread under test, at exactly 50% of its height. We have assumed that the flanks have the proper shape, angle, and pitch for the specified thread standard. It is generally unrelated to the major (D) and minor (D1) diameters, especially if the crest and root truncations of the sharp-V form at these diameters are unknown. Everything else being ideal, D2, D, & D1, together, would fully describe the thread form. Knowledge of PD determines the position of the sharp-V thread form, the sides of which coincide with the straight sides of the thread flanks: e.g., the crest of the external thread would truncate these sides a radial displacement D - D2 away from the position of the PD line. Provided that there are moderate non-negative clearances between the root and crest of the opposing threads, and everything else is ideal, if the pitch diameters of a screw and nut are exactly matched, there should be no play at all between the two as assembled, even in the presence of positive root-crest clearances. This is the case when the flanks of the threads come into intimate contact with one another, before the roots and crests do, if at all. However, this ideal condition would in practice only be approximated and would generally require wrench-assisted assembly, possibly causing the galling of the threads. For this reason, some allowance, or minimum difference, between the PDs of the internal and external threads has to generally be provided for, to eliminate the possibility of deviations from the ideal thread form causing interference and to expedite hand assembly up to the length of engagement. Such allowances, or fundamental deviations, as ISO standards call them, are provided for in various degrees in corresponding classes of fit for ranges of thread sizes. At one extreme, no allowance is provided by a class, but the maximum PD of the external thread is specified to be the same as the minimum PD of the internal thread, within specified tolerances, ensuring that the two can be assembled, with some looseness of fit still possible due to the margin of tolerance. A class called interference fit may even provide for negative allowances, where the PD of the screw is greater than the PD of the nut by at least the amount of the allowance. A dedicated type of micrometer, called a thread mic or pitch mic, which has a V-anvil and a conical spindle tip, contacts the thread flanks for a direct reading. A general-purpose micrometer (flat anvil and spindle) is used over a set of three wires that rest on the thread flanks, and a known constant is subtracted from the reading. (The wires are truly gauge pins, being ground to precise size, although "wires" is their common name.) This method is called the 3-wire method. Sometimes grease is used to hold the wires in place, helping the user to juggle the part, mic, and wires into position. An optical comparator may also be used to determine PD graphically." Check out our Dimensional Calibration Page for more capabilities.